Whilst the world tries to agree limits on carbon emissions, the task is made harder due to the rate at which some countries are developing industrially. 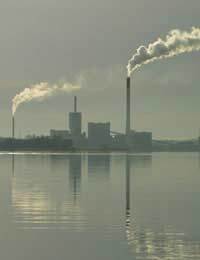 The difficulty, in part, is that it may be deemed unreasonable by some countries to have their development impeded by countries that themselves developed industrially through the employment of carbon technology. For this reason Western Industrialised nations are careful not to upset China and India on carbon emissions - countries who look set to become the next global economic superpowers. However, a failure to tackle growth in China and India may lead to global Climate Change catastrophe and could set a precedent for other countries to follow, thus further worsening the impact. China is now said to be on a par with the U.S. with regard to Carbon Emissions, with India following close behind. One major problem lays in the fact that China’s actual carbon use per head is far lower than those of the U.S. population per head. This means that each individual has the means to reduce Carbon Emissions in the U.S. whilst in People’s Republic of China the environmental responsibility lays with the government and big business, who are merely trying to create a business, technological and social infrastructure on a par with Western countries. The same could be said of India, with both nations needing to produce high carbon emissions in order to industrialise and alleviate poverty amongst its poorest population. What many nations therefore propose is that Western and other developed nations cut their carbon emissions further in order to allow developing nations to burn the fossil fuels necessary for their development. However, the U.S. currently argues that it should not have to cut its emissions by the significant amounts being asked of it if China (the closest carbon emitter in the world, in terms of quantity) is not asked to reduce emissions by the same amount. With the U.S. increasingly willing to tackle climate change issues and both India and China realising their importance it seems that some headway will be made and a treaty will be put in place to replace the Kyoto Protocol when it expires in 2012, on the back of loose agreement made in 2007 at the Bali Climate Change Conference. Under this agreement significant (but not precisely agreed) carbon emissions will be made worldwide, with developed nation giving technical help to developing nations. Some observers of Climate change claim that India and China need only expend such high levels of carbon in the period that they are in growth. In the next ten to twenty years they will have rebuilt their infrastructure to such an extent that they will be able to settle again to lower levels of carbon emissions. However, this will depend on the building of low carbon technologies within those countries. If this is achieved the pressure will again be back on the U.S. where one feels all the cards are really being held. The trouble here possibly is that power politics is being played where only environmental issues should be taken into consideration. The U.S. has every reason to wish to stay on a productive par with India and China, if it wishes to maintain its position of power in the world. All the while, such considerations threaten global stability as a whole.